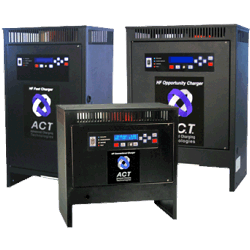 Chargers - International Forklift Co.
International Forklift Company offers a full line of ACT Chargers. 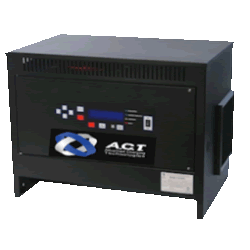 Advanced Charging Technologies is a leading manufacturer of forklift battery chargers and we ensure that our entire line of industrial chargers meet or exceed the California Energy Commission’s (CEC) strict energy efficiency standard. Powered by HF MOSFET Technology, this energy efficient technology will significantly reduce energy use and decrease energy. 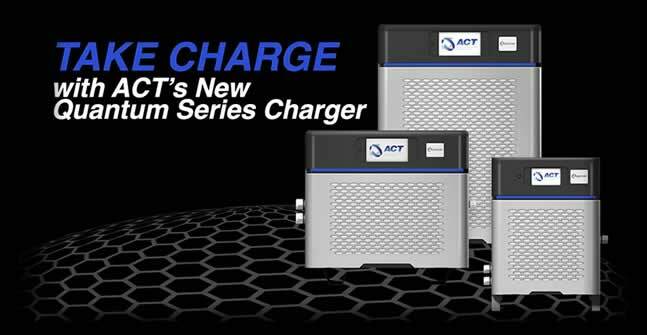 ACT Industrial Chargers feature lock out charging during peak hours, they’re stackable, and can be wall, column or stand mounted. 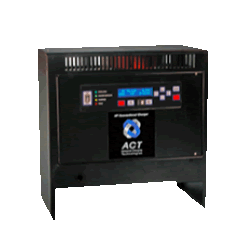 ACT Units have an advanced ventilation system, 3 year parts and labor warranty, and are RoHS Compliant. Ideal for an extended single shift operation (10– 12 hours), or for two shifts with a light to medium workloads, five to six days per week. Perfect for single and multiple shift, light to heavy-duty operations, where a battery is used for one shift.